The leader of Pennsylvania's largest labor union said that his union will re-think its close ties to the Democratic Party. Pennsylvania AFL-CIO President Rick Bloomingdale said the group did a poor job of listening to its members in the recent past, according to WSKG News. Bloomingdale embarked on a "listening tour" across the state following President Donald Trump's surprise victory in the state, which was in part inspired by blue collar workers. Bloomingdale said that his members feel "alienated" by liberalism. "We may have gotten too close to one party," he said. "We should be for people who are for us, regardless of party label." 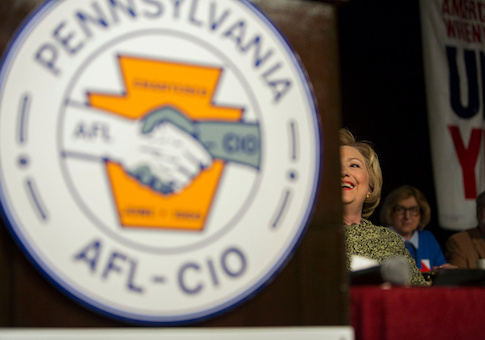 The Pennsylvania AFL-CIO worked hard to get Hillary Clinton and Democratic Senate nominee Katie McGinty elected in 2016. The union organized more than 10,000 volunteers and aimed to mobilize 450,000 voters to support the Democratic ticket, according to an October 26 press release. The union also sent out 580,000 mailers to union members and households touting Clinton's candidacy. "Working people have been leading the fight in Pennsylvania to elect pro-worker candidates like Hillary Clinton and Katie McGinty. The GOTV efforts of the Pennsylvania labor movement in the home stretch will help ensure victory on Election Day," Bloomingdale said in the October statement. After speaking with union rank and file, Bloomingdale said that the union's past strategy may have further alienated members. He said that union leadership plans to do a better job of listening to the concerns of their members, rather than attempting to dictate to them. "I think we were speaking too much at them, rather than having conversations with them," he said. Exit polls in Pennsylvania did not ask about union household status, as they did in other states, but a number of factors indicate that Trump appealed to blue collar workers. Trump won big in areas that have most acutely experienced factory closures and the decline in manufacturing, carrying 62 percent in the central region of the state, as well as 54 percent of voters in the west, according to the exit polls. Trump's opposition to free trade agreements also appealed to Pennsylvania voters—a position he shares with the AFL-CIO and numerous other labor groups. Trump won 64 percent of voters who felt that international trade "takes away jobs;" those voters made up 53 percent of the electorate. This entry was posted in Issues and tagged AFL-CIO, Unions. Bookmark the permalink.